The term "El Gordo" means "the Fat One." This term is the title given to the National Lottery of Spain. The El Gordo lottery has monthly draws having approximately €3 Billion total cash prizes; this earned for it the monicker the richest lotto game in the entire world. The July (summer) El Gordo draw is giving out as much as €140 million in total cash prizes. · The profit in the sales is distributed to the prizes. The profit shared is about 70% of the total earned income and this is regarded as the highest percentage in the world for a lotto game. Hence, the prizes in every ticket (called décimo) are very huge. In fact, roughly 35 out of 100 tickets have some kinds of prize. · The lotto has its own philosophy: to share the amount of prizes to the lucky players; and hence, every player has lots of chances in winning the lottery game. · The National Lottery is endorsed and authorized by the Spanish Government and prizes are guaranteed. · Winnings are tax free and paid immediately in the way that the winner likes. · The benefits earned by the Spanish government are used for public programs. How to play the Summer el Gordo? Playing the El Gordo July Draw is simple – purchase your tickets for the lottery draw. You can buy any number of tickets if you want. Alternatively, you can also join El Gordo Group and increase your chances of winning. The draw is held on the first Saturday of July. On this el Gordo draw, there will be numbers from 00.000 to 99.999. Every number is divided into “10 series. 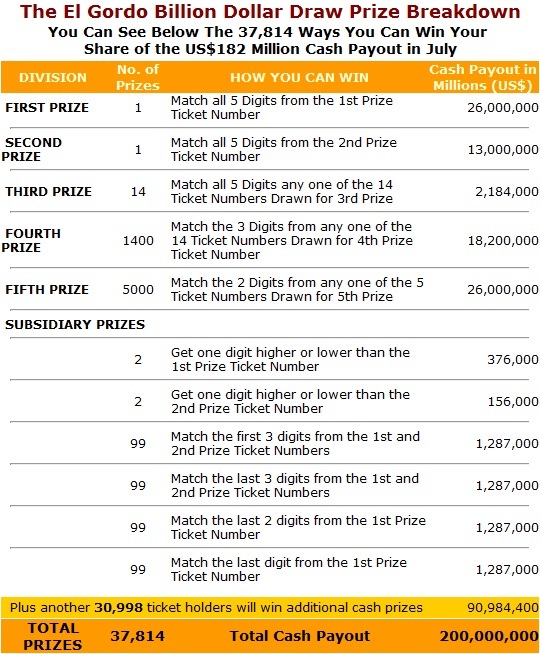 Every series is then divided to 10 decimos or the tickets which players can then buy from authorized lottery agents like Overseas Subscribers Agents.